Posted by This recipe is perfect for fall and winter days and stuff.. and they're a bit of work, but when you got a craving, you gotta make them.. and make them I dids! I ended up doubling the recipe and tossed the painstakingly time consuming (I am sooo slow at pinching dumplings!!!) little parcels of deliciousness onto a cookie sheet, freezing them solid and then transferring into a few ziplock bags so they don't stick together and I can enjoy them later when it'll be cold and miserable out and really weather appropriate food. Hopefully it'll be long enough for me to run out of them by the time I forget how long it takes to spoon filling, egg wash and seal edges is... its just like making perogies.. try to get some friends or family involved so you have more hands to help make these tasty morsels! First off, make some time to make some decent stock/broth. If you're in a hurry, the ready made prepacked chicken broth in a carton works, but you'll miss out on the richness and complexity that a good homemade broth/stock has. Its pretty simple - you just simmer the heck out of soupbones tossed in a large stock pot with random herbs if you like. Second is.. set some time aside for the actual "packaging" and pinching of the wontons.. then double it unless you're a machine.. they always take me longer than I plan for to finish pinching and making the last wonton. Step one: Defrost, discard the sandtrack (black line of shrimp intestine full of poo!) 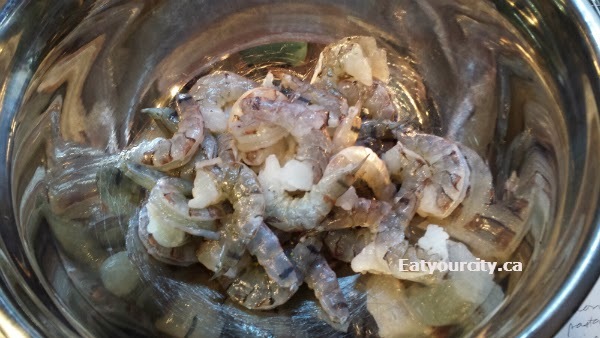 clean and deshell the shrimp into a large bowl. Dice or rip apart with hands the shrimp into small pieces. 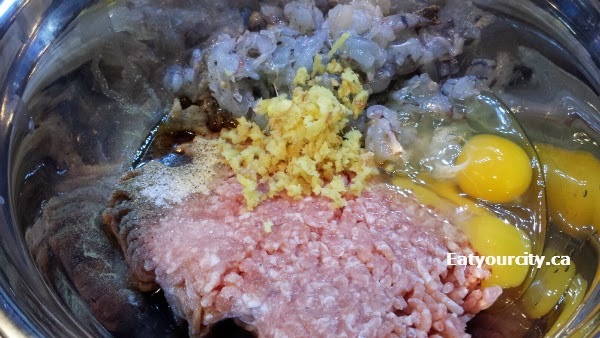 Step two: dump in the rest of the ingredients except for the wonton wrappers and mix well. You can let it rest in the fridge for 30 min to marinate if you like. I figured the meat mixture would sit around for at least that long whiel I wrap and pinch the wontons so I didn't bother waiting. Step three: The wonton wrapping and pinching part. You can use the yellow colored (stiffer, fries up better as it has more egg yolk in it - read ingredients, sometimes you're just paying for food coloring) wonton wrappers, or the pale white variety (softer, tender wrapper in soup wontons and bit more pliable so friendlier to newbies). Choose the square wrappers as the round ones are usually used for steamed siu mai (pork) dumplings and not wontons... makes it easier to wrap too. 3a) Place 1-1.5teaspoons of filling into the centre. Don't overfill (though I always try) as you won't be able to seal off the edges and you'll be just making very time consuming meatballs when you try to cook them later. 3d) Take the 2 pointy exterior edges, bring together like its a grumpy old man crossing his arms and press/wrap the tips together, using a bit of egg wash if required. 3e) It'll take a bit of practise to get them looking normal and not deformed (Took me a few tries to get this semi-normal looking one!) but you'll have 50 or so dumplings you'll be making to practise on lol! And don't worry if you end up with extra filling (make meat balls or flatten them and pan fry them), or extra wonton wrappers - the wrappers make excellent soupy soft noodles if you cut them into strip and boil them.. of fry them into crunchy salad toppers. Step four: Place all the wontons you want to freeze for a later time on a cookie sheet and freeze solid. Transfer to ziplock bags and pop them back in the freezer till you need them. I just place them on a cookie tray as I make them to make my life easier. Step five: Gently ease the wontons into a pot of boiling water. Simmer for 5 minutes and fish them out. Always cook the wontons in a pot of water separate from the soup as there's a lot of loose flour inherent in the wrappers, and with the possibility of exploded over-full wontons, it'll leave your broth with a lot more clarity and less cloudy looking. Add them to your broth with additional veges and wonton noodles if you like. Dig in!! 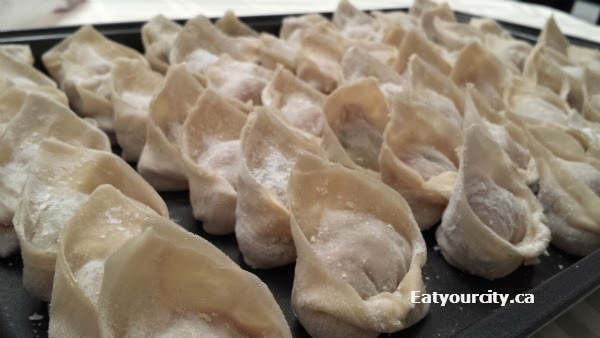 Pork and shrimp wontons recipe - this is a very basic recipe. Feel free to add in other herbs, meats etc and make it our own fav! Makes about 30-40 wontons. Pictures above depict the idiocy of doubling up the recipe lol.. took me about 2 hours to pinch 60+ of these buggers! **Optional: you can sub out the pork and make 100% shrimp wontons by using 1lb of shrimp instead, or feel free to sub out the pork with sausage or lean ground turkey to give it a different spin. 3) Place all the wontons you want to freeze for a later time on a cookie sheet and freeze solid. Transfer to ziplock bags and pop them back in the freezer till you need them. Soup wontons: Ease wontons into a pot of boiling water. Simmer for 5 minutes and serve with wonton noodles, vegetables and homemade broth. 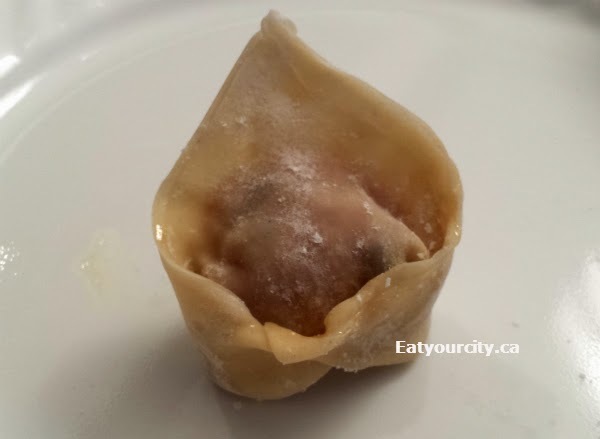 Deep fried wontons: Heat on medium in a deep wok or high lipped pot filled 1/3-1/2 way with canola or vegetable oil, once oil hits 350-375F, gently ease in room temperature wontons and fry until they are golden brown and crispy. Drain oil and enjoy! These look great, guys! I love soups but only do it very occasionally, and these are so perfect!